Here in Canada we’re wrapping up Emergency Preparedness Week. The nature of potential threats to an entire community can change over time. In the 1960s and 70s, the Cold War loomed in the minds of both citizens and government leaders. In this post, our Senior Archivist and government records specialist, Kyle Neill, reflects on archival records – some once secret – that show how Peel prepared for the worst. Peel County Emergency Measures Organization Control Centre, Chinguacousy Township, 1967 (left); County of Peel advertisement, Port Credit Weekly, 18 October 1962 (right). Photo: Peel Archives/PAMA, Brampton Guardian fonds, 1978.188. While the geopolitical rivalry known as the Cold War (1947-1991) was played out on the international stage, local municipal governments within Canada were responsible for ensuring the safety and security of their respective citizens. In the 1960s and 1970s many Canadians feared that Russian nuclear warheads, launched on intercontinental ballistic missiles, might strike within North America if the Cold War ever turned “hot.” The reality of governing during this “age of peril” is dramatically illustrated by records within the Peel County Clerk’s files. One of the major ongoing projects taking place here in the Peel Archives is the review and re-description of the Peel County fonds (also known as Record Group 12). 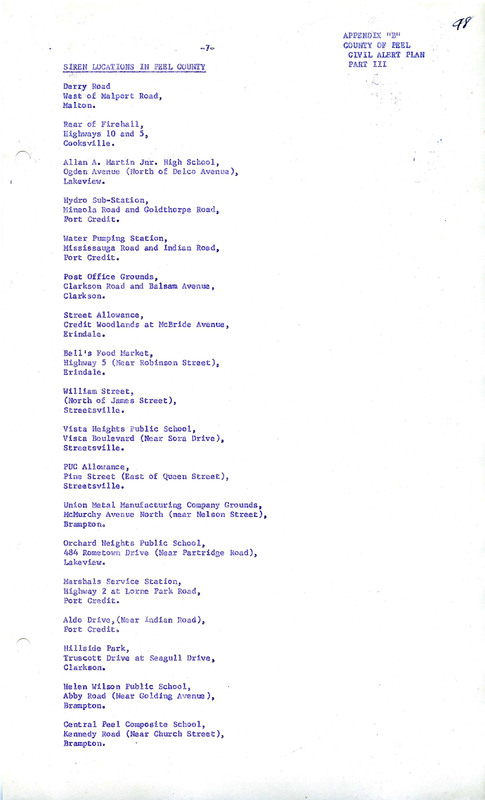 This fonds (or record group) consists of administrative, legislative, financial, and photographic records documenting the operation of the County of Peel, which existed from 1851 to 1973. Some of the most interesting records found thus far relate to the founding and operation of the Peel County Emergency Measures Organization. Peel Archives/PAMA. County of Peel fonds. 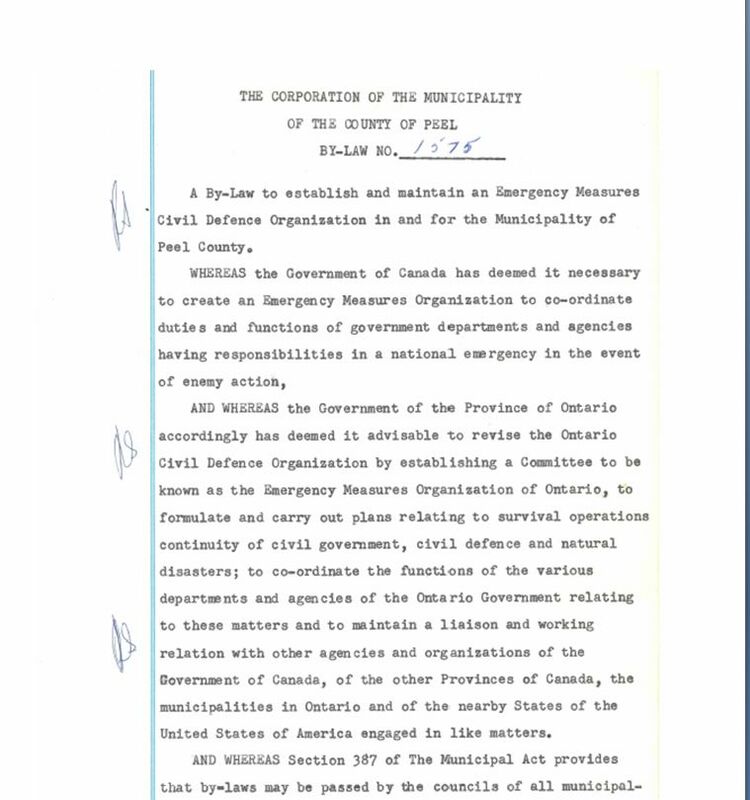 The Emergency Measures Organization (EMO) was quietly created by Peel County council on the 14th of July 1960 (via Peel County bylaw 1575). This organization was tasked with a) coordinating the emergency plans of municipal departments and services having immediate responsibilities in the event of a national emergency or natural disaster, and b) preparing plans for public survival. During the 1960s the Emergency Measures Organization went about fulfilling its mandate against the backdrop of continued international instability. Significant events in this time period included the Cuban Missile Crisis, the assassination of American President John F. Kennedy, and President Johnston’s escalation of the war in Vietnam. Evidence of the organization’s activities is best captured in a secret 1969 report found within the County Clerk’s files (the report has since been reviewed and declassified). 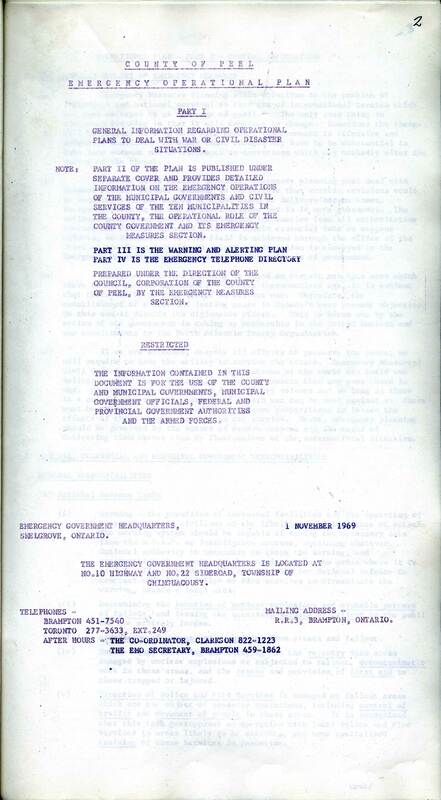 Entitled the Emergency Operational Plan for War and Major Civil Disasters, it provides fascinating insights into the Cold War mentality of the 1960s and the extent of emergency preparations in Peel during this volatile period. Peel Archives/PAMA, County of Peel fonds, clerk’s files, emergency measures. This report provides detailed insight into how the County planned to keep its citizens safe during a crisis of local, national, or international scope. Within its pages one can learn about the tasks assigned to the emergency government headquarters, the duties of the volunteer radio operators and the Radiological Monitoring Service, the composition of the County emergency government, and a variety of other topics. 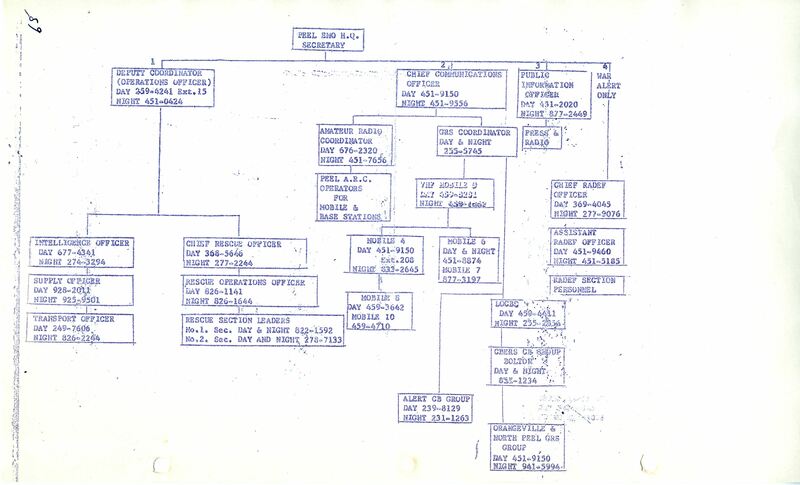 Flow chart showing responsibilities and contacts in an emergency, from the emergency operational plan. It is interesting (and chilling) to read the report’s analysis of the perceived strategic position of Peel County in the event of a nuclear strike. The report concludes that while Peel itself was likely not a primary target of an enemy attack, that any nuclear weapon striking more prominent targets, such as Metropolitan Toronto, Hamilton, or Windsor, would result in radiation, heat, and blast effects being felt within portions of Peel County, with the southern areas (Mississauga and Brampton) more directly impacted. The more northern Townships of Albion and Caledon were assumed to be outside of the primary scope of possible fallout. As a result, the plan was to have those areas provide manpower and equipment resources to augment those of the municipalities closer to the blast zone. They would also provide for the reception and care of evacuees, refugees, and casualties from Peel and surrounding areas. Disaster siren locations in Peel (again from the emergency operational plan). Click for a larger view. The report goes on to describe the locations of the Department of National Defence warning sirens installed throughout the county. By 1969 there were 18 warning sirens situated in Peel. These alarms were designed to alert citizens of an impending natural disaster or nuclear attack. Upon hearing a siren residents were to turn on their radios to receive instructions. 15 of the 18 sirens were located within the borders of the then Town of Mississauga, likely due to its higher population density, particularly in the Port Credit, Streetsville, and Lakeview areas. The remaining sirens were located in the Town of Brampton. Anyone interested in learning more about Peel County’s Cold War preparations is encouraged to visit the Archives to look over the report. 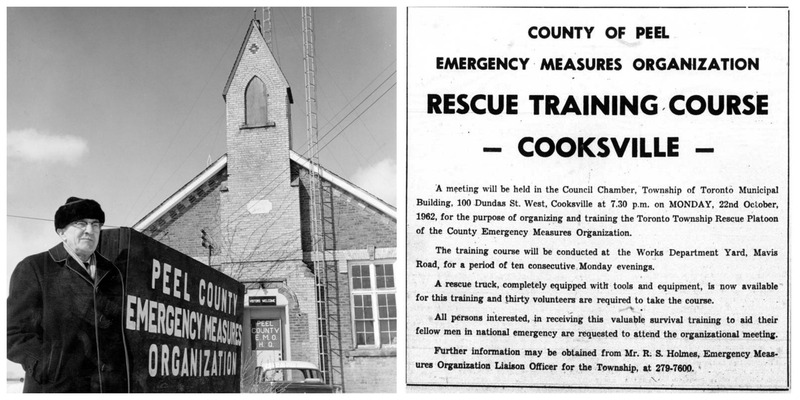 Citation: County of Peel fonds (RG12), series 6, file 143: Emergency measures, 1969 (RPA accession 1990.092). ← What’s it like to visit the archives?